Calling all Stanley Rangers members. There's going to be a New Year's Eve party at the Clubhouse on the 31st December open to all members and there are a few tickets left.. Tickets are £5 for adults and £2 for children and there'll be food and music. It is a ticket-only event so please contatct Paul Britton for details. See you there! Stanley Rangers have now been awarded Club Accreditation by the RFL. The purpose of achieving it is to demonstrate a club meets minimum standards in management, safety and accessibility for children and young people. The club has been working hard towards accreditation. Two of our youth teams went through to Round Two of the Bartlett's BARLA Yorkshire Cups, playing at the weekend. The Under 16s travelled to Dewsbury to take on Shaw Cross Sharks but were beaten 12-36. The Under 14s were at home to Siddal but were beaten 0-30. There were mixed results for our junior and youth teams in the opening rounds of the BARLA Bartletts Yorkshire Cup. In Round One, the Under 14s had an emphatic win over Stanningley B, winning 36-4; the Under 15s lost out to Skirlaugh Bulls 0-18; the Under 13s were beaten by Newsome Panthers 42-10 and the Under 12s lost to Heworth 6-34. The Under 14s will now be at home in Round 2 against Siddal on the 27th November, kick off at 11.30am. The Under 16s, who had a bye in the 1st round, will be away at Shaw Cross for Round Two also on the 27th November, K.O. 11.30am. After the break in matches for half term, this weekend sees our junior teams involved in the BARLA Bartletts Yorkshire Youth and Junior Cups opening rounds.. The Under 16s have a bye for Round One; the Under 15s will be away at Skirlaugh; the Under 14s are away at Stanningley B; the Under 13s are at home to Newsome Panthers and the Under 12s are at home to Heworth. The games will be played on the 6th November, kick off 11.30am. Last weekend, Stanley Rangers teams raised funds to help the family who suffered such a tragic loss in a house fire in Stanley. The Under 7s, Under 9s and Under 13s all held collections and donated to the Just Giving fundraising page. The U13s had a collection at the their home match against Castleford Panthers on Saturday and held one minute's silence. The club sends its deepest condolences to the families. The Under 18s have a coach but still need an assistant . Please note that training has changed from Tuesday November 1st from Thursdays to Tuesday eveniing at 6.30pm. For more information about the team please contact Sarah Trout via the club email stanleyrangers@aol.com or by mobile, number 07966 663345. Stanley Rangers juniors took part in a pre match festival along with three other community clubs from the Wakefield district before the Wales v Jamaica friendly on Friday 21st October and were lucky enough to walk out with the Wales team as this photo shows. The final score of the main match was 16-all. Calling all under 18s players! Stanley Rangers are forming an under 18s team for the new season and looking for new players and training has now begun on Thursday nights at the clubhouse, 6.15pm. We are also looking for team personnel - a coach, team manager, touchline manager and first aider. Anyone interested should contact Sarah Trout via the club email stanleyrangers@aol.com. The new season for our junior and youth teams is in full swing and the draw for the BARLA Yorkshire Youth and Junior Cups has been made. The Under 16s have a bye for Round One; the Under 15s will be away at Skirlaugh; the Under 14s are away at Stanningley B; the Under 13s are at home to Newsome Panthers and the Under 12s are at home to Heworth. The games are due to be played on 6th November. This weekend, on Saturday 22nd, the Under 13s are at home to Castleford Panthers, the Under 12s have a friendly at home to Meltham All Blacks, the Under 11s are at home to Bentley and the Under 10s are away at Sheffield Hillsborough Hawks. On Sunday 23rd, the Under 9s are away at Elland, the Under 8s are away at the Leeds Underdogs and the Under 7s will be at home to Hunslet Parkside. The final match of the season was a home fixture against Wigan St Judes and with a strong final performance it was a close run thing with Rangers only losing out 20-26. Stanley's points came from tries by Joseph Binns, Jordan Rice, Jacob Lord and Lee Alderson with goals successfully kicked by Rice and Lee Brickwood. On Saturday evening, the 8th October, the Open Age team had their presentation evening. Awards went to Young Player of the Year: Kieran Holt; Man of Steel: Chris Grice; 3rd place: Danny Grice; 2nd place: Jack Ledger; Player of the Year and also Player's Player was: Robert Hartley. A brave effort from 13-man Stanley Rangers at Blackbrook on Tuesday evening resulted in a 86-0 win for Blackbrook. Rangers had some good periods of play but were overcome by numbers in the end. The final game of the season is on Saturday at 2.30pm against Wigan St Judes, currently 8th in the table. Come along and gove the lads your support in their final game. Presentation Evening for the 1st team is going to be at the Clubhouse on October 8th. Thornhill Trojans proved too strong for Stanley winning 54-0. Rangers next game is tomorrow - Tuesday 20th September - when they travel to St. Helens to play Blackbrook in the rearranged fixture, kick off at 7.45pm. The final game of the season is at home on Saturday 24th September against Wigan St Judes. At the recent Wakefield Triniity Wildcats' Academy and Youth Awards evening former Stanley Rangers Liam Senior was awarded the Man of Steel in the Under 19s Academy. Liam played through the junior age group teams at Stanley before joining the Wildcat's Academy scheme. He was also in the England Academy 17-man squad that toured Australia this summer. Congratulations Liam! Well done to three of our Under 16s who have been selected for the Yorkshire BARLA Tri-County squad. Nigel Dangare, Kian Holroyd and Edward Wilcock all went through trials last week and were selected for the squad. The BARLA Three Counties Tri-Series comprises Yorkshire, Lancashire and Cumbria and match dates will be announced shortly. Congratulations to Nigel, Kian and Edward and we wish them good luck. Sixteen-man Stanley Rangers went ahead against visitors Bradford Dudley Hill thanks to a Kenny Walton try but the visitors proved too strong coming out 52-14 winners. It was a mighty effort from Stanley whose other points came from tries by Shaun Abson who converted his own try and Jamie Bell. The next match will be away at Thornhill Trojans on Saturday, kick off at 2.30pm, then there is the re-arranged fixture at Blackbrook on Tuesday 20th September, kicking off at 7.45pm. The postponed fixture against Blackbrook that should have been played on Saturday 3rd September has now been rearranged for a mid-week match. Rangers have a home game this Saturday the 10th against Bradford Dudley Hill and will then play on the 17th September away at Thornhill Trojans. The rearranged fixture against Blackbrook will now be on Tuesday 20th, kick off at 7.45pm and then the final fixture is at home on Saturday 24th against Wigan St Judes. After a two-week break the 1st team will travel to Blackbrook on Saturday - 3rd - kick off at 2.30pm. Blackbrook, currently sixth in the table, play at the Blackbrook Sports & Recreation Club, Boardmans Lane, Blackbrook, St Helens, Merseyside, WA11 9BB. PLEASE NOTE: This fixture has been cancelled. In a bottom-of-the-table clash, Stanningley came to Stanley but proved too strong in the final part of the second half to beat the hosts 40-24. Stanley's tries came from tries by Kieran Holt, Shaun Abson, Liam Crawley and Anton Porter, with four goals from Danny Grice. This weekend - 13th August - in Round 18 of the fixtures, Stanley are again at home to mid-table Saddleworth Rangers. Kick off is at 2.30pm. Use the link here to book players on Wakefield Wildcats as places are limited to 50 attendees per day so be quick as booking will be going very quickly. More information can be found on the Trinity website. 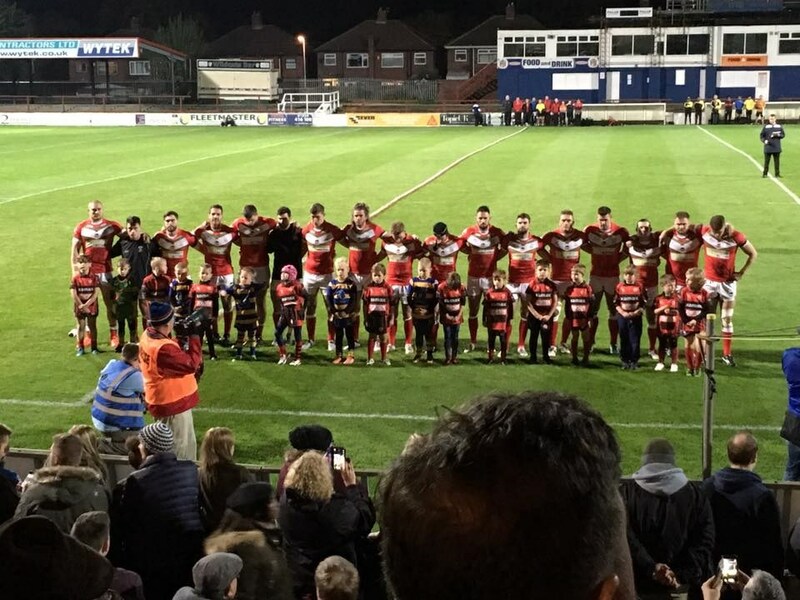 Dewsbury Celtic did the double over Stanley beating them 28-10 on Friday evening. Rangers points came from tries by Shaun Abson and Liam Crawley, with one conversion by Danny Grice. The next game is at home on Saturday 6th August against Stanningley who are just one place above in the table. Top-of-the-table Hunslet Club Parkside overwhelmed Stanley Rangers with q 72-4 win on Saturday. Joel Marsh provided Ranger's only points. Please note that this week's fixture away at Dewsbury Celtic has been changed to Friday 29th July, kick off at 6.45pm. The venue is at Dewsbury Irish National Club, WF13 2QJ. Stanley Rangers are pleased to announce their Sportsman's Dinner this year will be an evening with the legendary Sean Long on Saturday August 13th. Sean had a long career with St Helens and Great Britain and was awarded the Lance Todd Trophy three times. 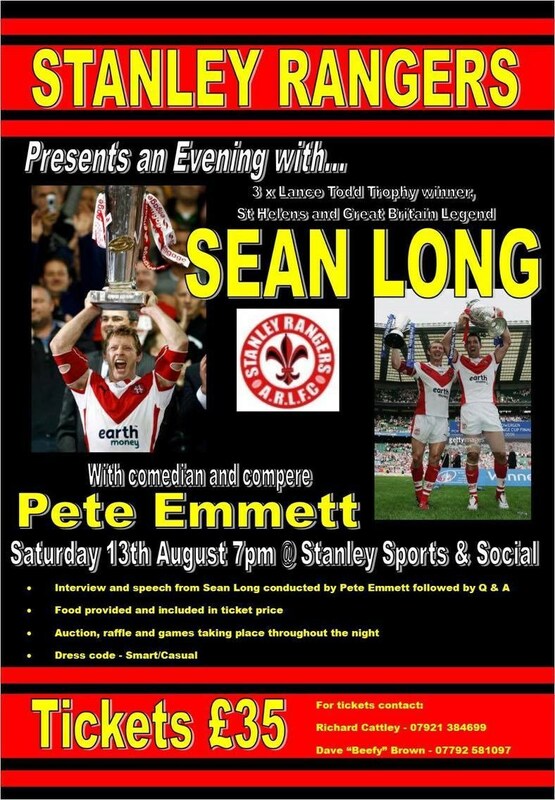 The evening will include a speech and interview conducted by compere Pete Emmett with a Q and A session after. Food is included in the ticket price which is £35. The evening kicks off at 7pm and dress code is smart casual. Huddersfield Giants are holding their Embed the Pathway summer camps in July and August. For U12s and U13s there are three dates - 25th July, 8th August and 22nd August between 10-12 noon- with registration at 9.30am for all dates. For the Under 14s dates are Tuesday 26th July, 9th August and 23rd August again registration at 9.30am, with the sessions running from 10-12 noon. Sessions are free. After a rest last weekend, the 1st team resume playing with an away fixture against Hunslet Club Parkside, kick off 2.30pm. There is no fixture for the A team. The only game in Division Two played last weekend was between Saddleworth Rangers and Askam with Rangers beating their promotion rivals by a close 22-18 to move them up to third place. The junior teams are now having their summer break, resuming playing in September. FUN FOR ALL AT STANLEY! 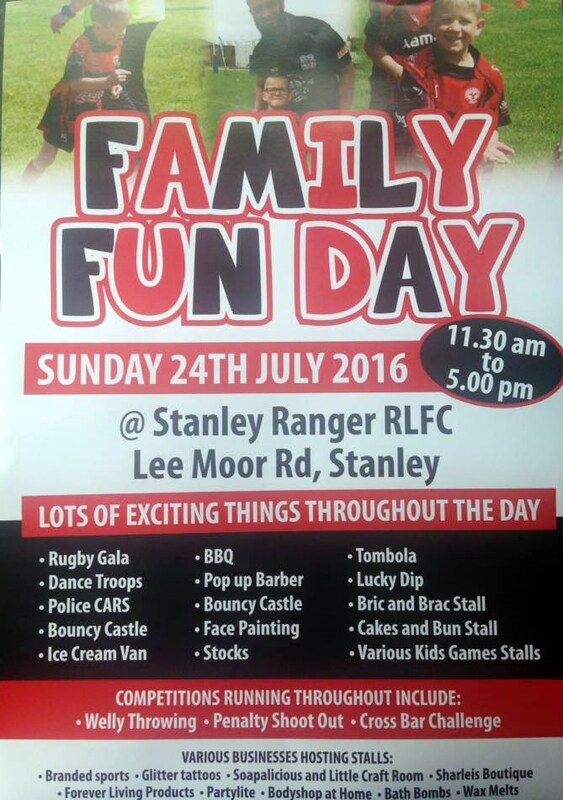 Stanley Rangers will be holding a Family Fun Day at the clubhouse on the 24th July from 11.30am to 5.00pm. There will be lots of events throughout the day including a rugby gala, dance troupes, bouncy castle, face painting, bbq and lots of stalls. The funds raised will be going to two causes - the LGI Respiratory Unit where one of our youngsters in the under 7s is a regular attendee and the Outwood Grange Academy boys for their Australia. Tour who will be helping on the day. Come along and have a great time and support such worthy causes. Congratulations to our Under 16 players who have signed professional academy contracts. Ryan Butterworth has signed for Bradford Bulls, Owen Trout and Alfie Goddard will be going to Leeds Rhinos academy and Charlie Frost and Nathan Newbound have signed for Wakefield Trinity. Leeds Rhinos Foundation and Yorkshire Cricket Foundation will be holding a fun-filled family day at Headingley Carnegie Stadium on Saturday July 17th from 10am - 4pm. There will be a live performance from X Factor's Jake Quickenden, Breeze musicians, interviews with the Leeds Rhinos team, Jamie Jones Buchanan and the team from Rugby AM and plenty of crafts and activities for all the children. Admission is £3 per adult and just £1 per child (age 5-17) and a family ticket (2 adults and 2 children) is only £5. Family tickets need to be bought from the Leeds Rhinos ticket office in advance but all other tickets can be bought on the day or beforehand. Once in the ground, all activities are free. Call 0371 4231315 or follow the link below. 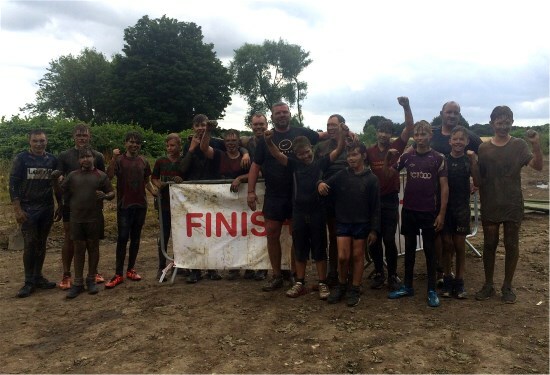 The Under 13s coaches, players and parents took part in a tough outdoor assault course at the fitnesssuccess-obstaclegym.co.uk. Everyone was really put through their paces by the instructors but all kept going until the end and had a real sense of achievement. Second-place Leigh East proved too strong for Stanley Rangers beating the home side 58-10. Stanley's points came from tries by Danny Grice and Chris Grice with one goal from Danny Grice. Leigh East's Adam Ball scored a hat-trick and Tom Worthington kicked nine goals. Other tries came from Tom Fletcher, Chris Dootson, Ike Watene and Simon Reynolds. There is no first team match this Saturday - July 16th - and the A team have a fixture away against York Acorn B.
Stanley celebrated coach Gary Lord's birthday with a close win against Askam 16-14. Tries came from Chris Grice, Shaun Abson and Jacob Ware with two goals from Danny Grice. The game that was scheduled between Stanley Rangers A and Farnley Falcons A tomorrow, Saturday 2nd July, has been postponed. Stanley Rangers travelled up to Cumbria to take on Askam, currently in fourth place in the table but lost 40-5. Stanley's points came from a try by John Nunns and a drop goal by Kieren Holt. The next match will be on Saturday July 2nd at home to Salford City Roosters. Come along and support the team! Stanley Rangers 1st team travel to Cumbria on Saturday to play fourth place Askam. The match kicks off at 2.30pm at Fallowfield Park, Sandy Lane, Askam in Furness. The following weekend - July 2nd - Rangers are at home to Salford City Roosters, kick off at 2.30pm. The 2nd team game against Farnley Falcons A has had to be postponed and it has not been possible to get a replacement fixture. The next scheduled A team match is away at Farnley Falcons A on July 2nd. The 1st team struggled against the top-of-the-table, unbeaten team Hunslet Club Parkside and were beaten 0-62 on Saturday. 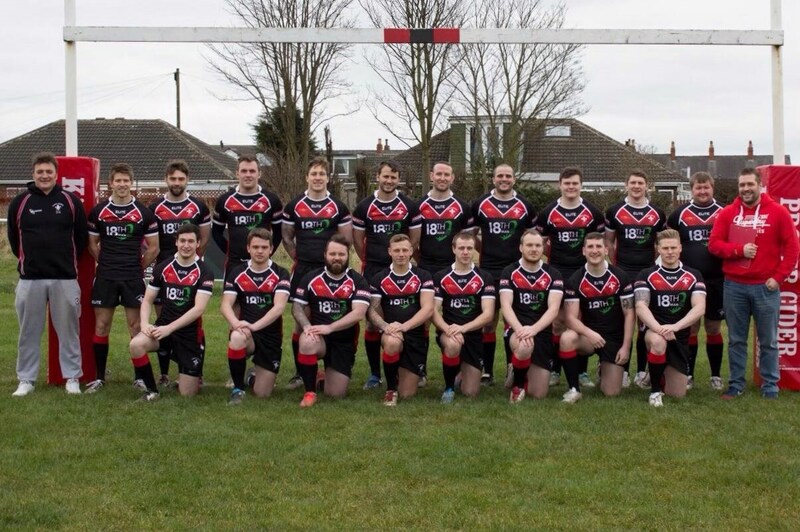 This weekend - Saturday June 18th - there is no first team game but the A team are playing in the Yorkshire Mens League against Farnley Falcons A, kick off at 2.30pm. The next 1st team game will be on the 25th June away at Askam. A 14-man squad travelled to Leigh East at the weekend but found the task too much losing out to the home side 96-6. Stanley's points came from a Johnny Dickinson try, converted by Grice. This weekend - 11th June - Stanley are at home with Hunslet Club Parkside visiting. The team needs your support so please come along. After the weekend Bank Holiday break, the seasons resume for our teams. The Open Age will be fielding two teams on Saturday 4th June with the 1st team away at Leigh East and the A team playing away at Allerton Bywater A. Saturday fixtures continue for the junior teams with the U10s away at Thornhill Trojans; the Under 11s are at home to King Cross Park; the Under 12s are away at Heworth and the U13s fixture against Featherstone Lions has been postponed (the two teams will be meeting each other in the semi final of the YJ U13s cup on the 11th June). On Sunday 5th June, the Under 16s are away at Oulton Vikings; the Under 15s are at home to New Earswick All Blacks; the Under 14s are away at Hunslet Parkside, the U9s are at home to Castleford Panthers; the Under 8s are also at home to Batley Boys and the Under 7s are at home to Dewsbury Celtic. The Elite Rugby Academy are holding a training session at the club Tuesday 31st May for Stanley Rangers Under 10s, Under 11s and Under 12s, starting at 6pm. 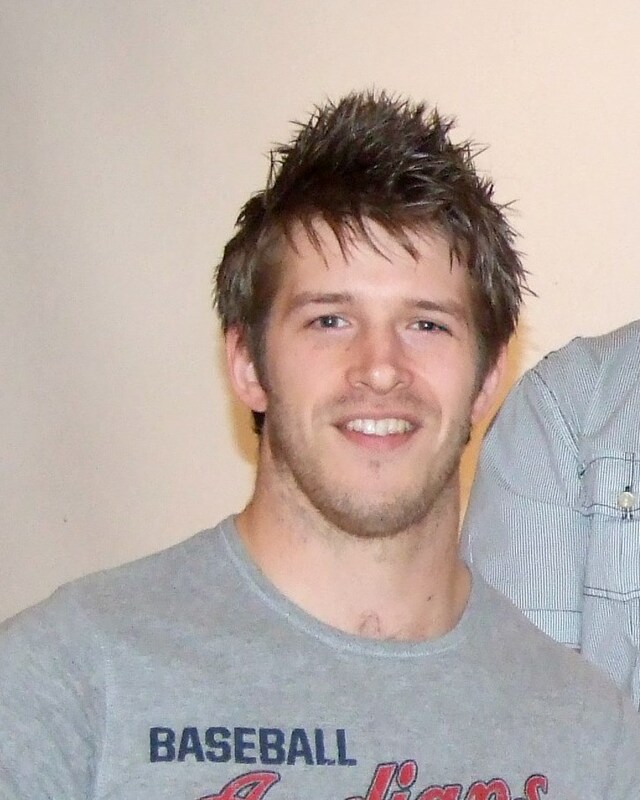 The Wakefield coaches are professional rugby players Jay Pitts and Joe Arundel who have plenty of experience under their belts and will aim to inspire and motivate the teams in an enjoyable way. The England Academy beat the French U18s on Friday May 27th by a resounding 52-20. England led 26-6 at half time and continued with a strong second half performance to be worthy winners. Ex-Stanley Rangers player Lewis Heckford, currently with Wigan Warriors, scored the last try of the match. Rangers lost a 14-8 half time lead to be beaten by one converted try by Dewsbury Celtic 24-18 on Friday night. Stanley's points came from tries by Danny Grice, Joel Marsh, Oliver Lightfoot and Jack Ledger with a goal from Danny Grice. The next game for the 1st team is on June 4th away at Leigh East and the A team will also be playing away at Allerton Bywater A. There are no junior team fixtures this weekend - May 28-29th - due to the Bank Holiday. Fixtures resume the following weekend of the 4-5th June. Congratulations to Lewis Heckford who was part of the successful 2014 Under 16s team who won the BARLA National Cup and the Wakefield Cup. Lewis signed for Wigan Warriors and is in their Under 19s squad and has been named in the England Academy squad to play against France U18s at the Halliwell Jones Stadium on Friday May 27th, kick off 5.30pm, prior to the Warrington Wolves v Leeds Rhinos game. Tom Megretton who is signed for Wakefield Trinity is now playing in the Trinity Under 19s, whilst Max Jowitt has been making first team appearances for the Wildcats. There were mixed fortunes for the first time this season when Stanley fielded two teams. The 1st team had a disappointing result against Wigan St Judes losing 60-0 but playing with only 14 men. The A team had their first game of the 2016 season with a friendly against Dewsbury Celtic losing by just four points 32-36. The next time Rangers will be fielding two teams will be on June 4th when the A team are away at Allerton Bywater A. The draw for the semi finals of the Yorkshire Juniors and Youth Cups 2016 was made on the 16th May annd Stanley Rangers have seen two of our junior and youth teams make great progress. The Under 13s will be at home to Featherstone Lions and the other Under 13s semi is Hunslet Warriors v Siddal. The Under 16s beat Oulton Vikings 18-10 and will now be at home to Stanningley A. The other U16s semi is Shaw Cross Sharks v West Hull. The matches will be played on the weekend of the 11-12th June. Well done to both teams and good luck. UNDER 15s TUFF IT OUT! 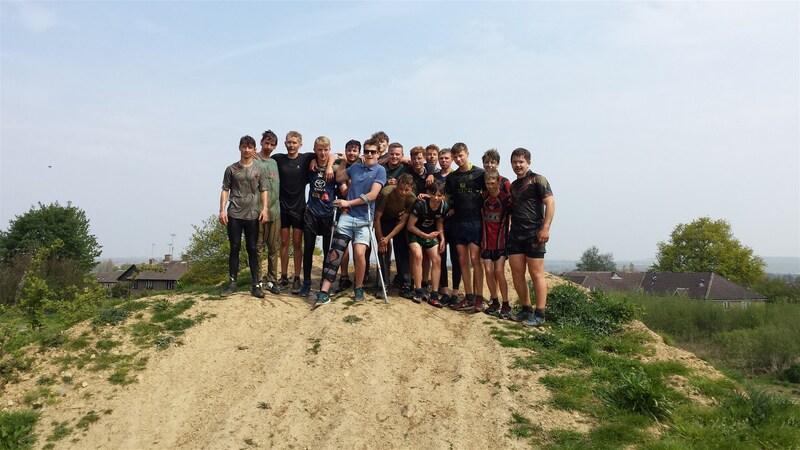 The Under 15s recently toughed it out with a mid-season team building exercise at the outdtood gym at Rothwell. The team work displayed by the boys was amazing and everyone made it to the end - not quite the same for their trainers! (Thanks to Stewart Foster, team manager for this news and the great photo). Stanley Rangers travelled over to Salford to meet up against the Salford City Roosters but were not able to come away with the points, losing 26-18. This coming Saturday - 14th May - Stanley are away again to play Wigan St Judes, currently 7th in the table. The Open Age A team will begin their season in the Entry League of the Yorkshire Men's League. The YML consists of five divisions and an entry league. Stanley Rangers A team now have a fixture list and will begin on May 14th at home to York Acorn B. The next matches will consist of home and away fixtures against York Acorn B, Farnley Falcons A and Allerton Bywater A. Our Under 7s, 8s and 9s enjoyed a training session last week with Joe Arundel and Jay Pitts of the Elite Rugby Academy learing new drills and having fun. The under 7s also took part in the Under 7s Festival at Wakefield Trinity Wildcats today, organised by the Wildcats Trust. The prematch tournament was enjoyed in the bright sunshine by all the youngsters who went on to watch Wakefield Trinity beat Toulouse Olympique 40-22 in round six of the Challenge Cup. Rangers last two games have seen the team experience player problems. At home against Blackbrook on the 23rd April, the game was interrupted by a serious leg break to Richard Cattley when twisting in a tackle. Stanley were trailing 24-10 at the break but put up a spirited second half performance but Blackbrook finished the stronger winning 44-24. Last Saturday (30th April) Rangers played againt Division One side Thatto Heath Crusaders in the first round of the Challenge Cup. Playing with only 15 men Stanley were down 42-0 in the 65th minute before Jonny Dickinson crossed the whitewash for a try converted by Danny Grice. This weekend - 7th May - Stanley Rangers are travelling across the Pennines to play Salford City Roosters, at the Moat Hall Sports Centre, Hallsworth Road, Eccles, kick off 2.30pm. Mixed results for our two teams who have reached the Final of the Wakekfield Cup for their age group. The Under 14s played their Final at Belle Vue on Wednesday 27th April against Normanton Knights Under 14s. The final result was Normanton U14s 19 - Stanley Rangers U14s 8. Commiserations to our boys but well done for reaching the Final. Meanwhile the Under 12s are through to the Final of the Wakefield Cup Under 12s age group and will face Normanton U12s on 25th May 2016. Good luck to the team! In a closely-fought match, hosts Stanningley just beat visitors Stanley Rangers 14-12. Next Saturday - 23rd April - Stanley are at home to Blackbrook. Kick off is 2.30pm and everyone is welcome. Rangers had their second draw of the season with a 19-all result against Thornhill Trojans on Saturday. Stanley were leading 18-12 at 63 minutes with tries from Jack Shepherd, Joel Marsh and Neil Ackroyd, all converted by Danny Grice. However the Trojans fought back with a Joss Ratcliffe try, converted by Andrew Bates. This Saturday - 17th April - Stanley have a short trip to Stanningley and on the 23rd it's a home fixture against Blackbrook. Matches kick off at 2.30pm. Stanley Rangers travelled across the Pennines to Saddleworth last weekend but the home side proved too strong, winning the match 52-6. Rangers points came from a James Fox try, successfully converted by Danny Grice. This Saturday the 1st team are at home to fourth place Thornhill Trojans so come along and support the lads! The draw for the Yorkshire Junior League Challenge and Continuation Cups has now been made and all our junior teams are involved. The Under 12s are in Round One of the Continuation Cup and will play Oulton Raiders away on Wednesday 13th April; the Under 13s are in Round One of the Challenge Cup and are away at East Leeds or Heworth; the Under 14s are at home to Oulton Raiders in the Preliminary Round of the Challenge Cup on April 10th; the Under 15s are also at home on April 10th against Eastmoor Dragons in the Preliminary Round of the Challenge Cup and the Under 16s are at home to Hull Wyke in the Preliminary Round of the Challenge Cup on April 24th. Good luck to all our teams! Stanley Rangers are pleased to announce that they are now selling a speciality beer brewed by Trinity Brewing Company. Brewer Neil Land and chief assistant Steve Locking commissioned the new line last Friday at the club. The new beer which is called Belle Vue Blonde a 4.2%ABV is a light beer. There will also be trials at a future date of the other cask beers from the same company. In a second half fight back Rangers drew with visitors Askam 24-24. The Cumbrians fielded a strong side and led at half time but a strong second half performance from Stanley saw the score even up until the final moments when a penalty ensured a 24-all draw. Tries for Rangers came from a Joel Marsh hat-trick and one for Cooper, with Danny Grice kicking four goals and gaining Man of the Match. There was a good home crowd to watch and a good atmosphere. There are no fixtures at the weekend because of Easter and the next match will be on April 2nd away at Saddleworth Rangers. Wakefield Trinity Wildcats are running the Embed the Pathway Scheme and have arranged that the U12s and U13s player development days will now be held together on Tuesday 29th March from 10am until 2pm at Belle Vue Stadium rather than two separate sessions. The Embed the Pathway programme is supported by Gillete and is the first rung of the England performance ladder that aims to “Improve players by Improving Environments”. The days will include player skill development carousel stations and an opportunity to showcase the skills in small sided games. Alongside the training aspect there will be opportunity for parents to observe and discuss the programme with the ETP coaching staff. A quick three-try start for Dudley Hill after 26 minutes gave Stanley some work to do but tries from Joel Marsh and John Nunns put Rangers back in contention after an hour within four points. However Bradford dominated the final quarter resulting in a 38-10 win to the home side. Rangers' Man of the Match was Danny Grice. This weekend - 19th March - Stanley have their first home game of the season against Askam. Kick off is at 2.30pm so come along and give the team your support. Match day is nearly here! The first game of the 2016 NCL season kicks off on Saturday 12th March when Rangers travel to Dudley Hill for a 2.30pm kick off. The first home game for Stanley will be on Saturday 19th March when Askam travel to Lee Moor. 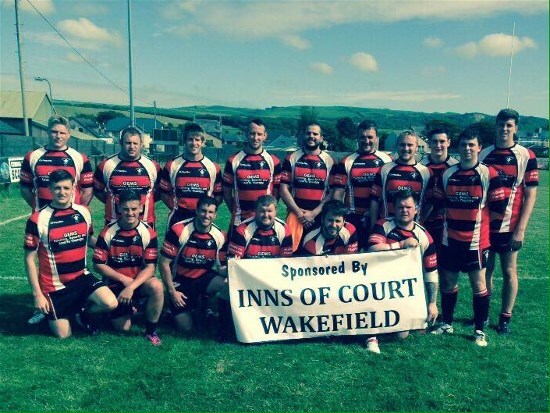 The Yorkshire Men's League will begin their season in May. Snowfall on Friday 4th led to many of the junior fixtures being cancelled at the weekend. Only two of our teams played their matches which resulted in the Under 12s being beaten by Brotherton Bulldogs 36-0 and the Under 15s just losing out to rivals Eastmoor Dragons 18-16. The Yorkshire Junior League kicks off this weekend with matches for all our junior teams on Saturday 5th and Sunday 6th March. On Saturday 5th, the Under 12s play away at Brotherton Bulldogs and the Under 13s are at home against West Bowling. Then on Sunday 6th, the Under 14s will be at home to East Leeds; the Under 15s are away to local rivals Eastmoor Dragons and the Under 16s will also be at home against East Leeds. The new fixtures are now on each team page. Good luck to all our teams for a successful season. In a recently-found programme from December 2006, Stanley Rangers were playing in the final of the Yorkshire Cup against East Hull Dragons. Our match report of the game on the website said "Stanley so nearly succeeded in their quest for the Yorkshire Cup but had it taken from their grasp by a last minute try from East Hull Dragons and saw the silverware go to the Humbersiders with an 11-12 final score. Ranger's coach, Gary Lord although disappointed was proud of the team and of their performance in an exhilarating cup final at the Moyles Stadium." Some familiar names on the Stanley team include Richard Cattley, Chris and Danny Grice and Liam Crawley. In a closely-fought game, this pre-season friendly ended with a 24-20 win for Stanley, With four tries apiece it was Danny Grice's 100% kicking that made the difference. There's just two weeks before the start of the new season and the Open Age squad are now training at the clubhouse. This Saturday the Open Age team will be making the trip up north for a pre-National Conference League season friendly against Gateshead Storm CRLC. The game kicks off at 2.30pm. The match will be played at the Winlanton Vulcans RFC ground at Axwell View, Gateshead. It's just 4 weeks to go before the National Conference League kicks off on Saturday 12th March. The Open Age squad have been training in preparation with gym and outdoor sessions. Training will now be at the clubhouse on Monday and Wednesday evenings, 7pm. The first match will be away against Bradford Dudley Hill, 2030pm kick off. Stanley Rangers are one of 10 clubs that have joined the Wakefield Trinity Wildcats Ambassador Scheme. The Ambassadors Scheme was launched in December 2015 is focused on building budding relationships with local community clubs to see" the club be more proactive and responsive with our juniors and youth Rugby League teams to get more children involved with the sport and have a healthy lifestyle". The under 6s with coach Emma King were involved in pre-match games on Sunday 7th February and were part of a half-time parade after which the coaches were presented with a signed rugby ball and a season ticket. The first fixture for Stanley Rangers 1st team in the National Conference League Division Two is on Saturday February 12th when they play away at Bradford Dudley Hill, kick off 2.30pm. The first home fixture is on the 19th when Rangers take on Askam. The Kingstone Press Cider National Conference League has changed its promotion and relegation rules ahead of the 2016 season. The league's intention is to have 12 teams in all divisions for the 2017 season. There will be 12 teams competing in the Premier Division, Division One will have 14 teams, Division Two will have 12 teams and Division Three will have 10 teams. Stanley Rangers will be playing in Division Two which will have one automatic promotion place to Division One, with another team promoted by way of a four-team play-off. Three teams will go down to Division Three, with one coming up. 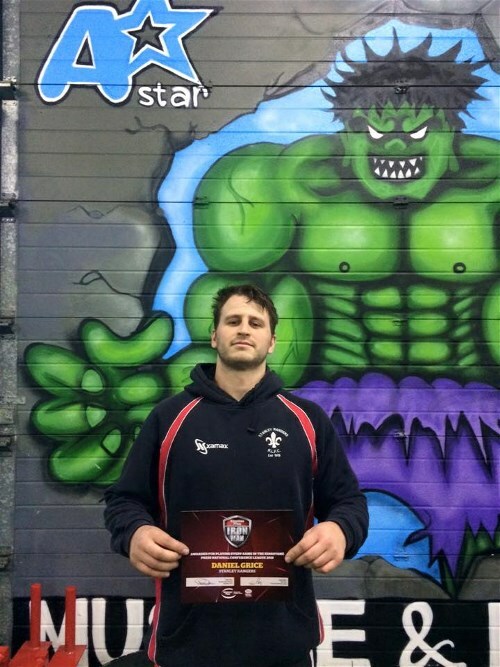 The inaugural Kingstone Press Iron Men were named at the National Conference League AGM earlier this month. The award – given to every player who plays in all regular season games for their club – saw six players from the Premier Division achieve the accolade, whilst there were 18 in Division One, 40 in Division Two and 13 in Division Three. “It’s a great effort to play in every game throughout the season,” said NCL Chairman Trevor Hunt. Stanley Rangers Danny Grice was one of the Division Two players - congratulations from the Club! The Under 16s played in the semi final of the BARLA XAMAX Yorkshire Cup and in a closely-fought match lost 10-22 to Shaw Cross Sharks U16s. In the other semi final East Hull beat East Leeds 34-16. The Final will be played at the John Charles Stadium, Hunslet, on Sunday 24th January, kicking off at 11.30. Well done to our Under 16s for reaching the semis and good luck for the new season. The 2016 Kingstone Press Cider National Conference League opening round fixtures have been published and Stanley Rangers 1st team will be playing in Division Two. The first two fixtures will begin in March with an away game at Bradford Dudley Hill and then on the 19th the first home game for Stanley will be against Askam. The complete fixtures list will shortly be on the Open Age team page. Pre-season training will be on Mondays for indoor gym training at 7pm at Astar muscle & Fitness, 136 Thornes Lane, Wakefield, WF2 7RE. On Wednesday evenings it will be at Stanley Rodillians RUFC, time to be confirmed. Please keep an eye on texts for pitcdh or time changes. Finally on February 20th there will be a friendly match against Gateshead Storm in Newcastle. It will be an early afternoon kick off and a perfect opportunity to blow the cobwebs off and put in to place structures ahead of the new season. This is a squad game so please make yourself available and everyone will get game time.